PlantMiner continues to expand its resources to keep up with the ever growing demand of plant and equipment hire in Australia. We started April with 70 employees and grew to a team of 78 by the close of May. In fact, June is expected to grow to 85+ employees. 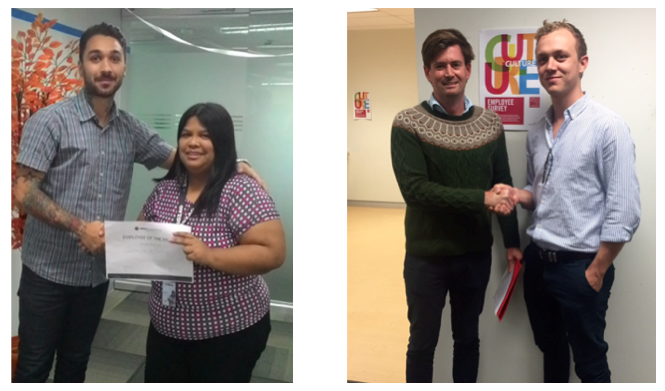 PlantMiner would like to congratulate Genevieve Sotto and Lachlan Crane for acquiring May's Employees of the Month. Lachlan Crane is a Client Manager for New South Wales and has really lifted the company in the right direction. Starting only two months ago, Lachy has already reached new heights and set new (sky high) limits for all of our Client Managers. In the past month, Lachy has signed up over 15 suppliers to PlantMiner.com.au. Lachlan personally engages with suppliers and expands their client network by delivering them highly qualified leads from local searchers seeking to hire their plant or equipment or contracting services. Gen answers all incoming enquiries and processes quote requests through the PlantMiner system. Since her start in March, Gen has a proven eagerness to learn and work hard, but is also commended for conducting herself in such a positive and team boosting way. Gen is a conscientious role model for not only the administration team, but the PlantMiner workforce as a whole. We look forward to watching Gen grow and prosper with PlantMiner. If you’d like to learn more about joining the PlantMiner team, please get in touch by contactinghr@plantminer.com.au, or by checking our current career opportunities on our careers page.